Babson Food Day is 3 weeks away! Food entrepreneurs of all kinds: Babson Food Day is just three weeks away. October 23, we’ll celebrate food as everybody’s business. We say that if you eat food, you are an eater-entrepreneur. Come learn, share and act your way further into your food journey. Babson Food Day offers a “menu” of options with something for everyone: food stories from across the system; start-ups and fresh ideas from students; corporate pathways into food; and culinary and restaurant innovation. Babson Entrepreneurs-in-Residence Andrew Zimmern (Bizarre Foods) and Gail Simmons (Top Chef, Food & Wine Magazine) are with us all day. 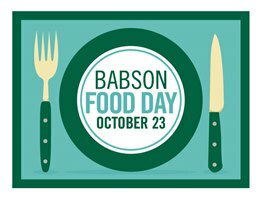 Babson Food Day is free and open to the public. Our menu is HERE… See you there!